. In it, the author does what good writers should: She takes me on a journey, shows me something beautiful, and makes me not want to come back. the period of time in which the author, Faith, on the verge of flunking out of college, takes some “time off” from school. But unlike most students, who travel to Paris or Italy, backpacks in tow, Faith Adiele travels to the Far East—to the remote areas of Thailand. A self-declared sociologist, she jumps head first (and hairless might I add) into a Thai wat seeking to understand Buddhism and women’s roles in the religion. (Are you sensing her ardent commitment?) She exchanges comfort, pleasure, and daily communication for a commitment to refrain from entertainment, touching money, all forms of entertainment, sleeping on soft surfaces, and consuming food at inappropriate times, which is most of the time. Sound fun? try not killing a single bug while living in a forest! ), watching her comical failures and her thrilling successes. Pushed by her teacher, Maechi Roongduan, she progresses, so that what once seemed impossible for Faith’s mind and body becomes customary. personal. 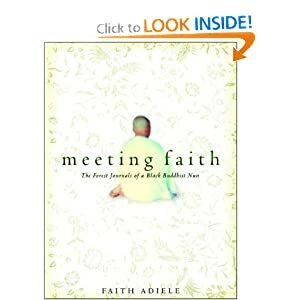 Faith learns that while studying them, she must examine herself, and in discovering their faith, she must uncover her own as well.